Scottie Mom: The Return of the Evil "C"
I am so very sorry to read this. Heather has brought me a lot of joy these past few years reading about her and Mr. K (and you too). You've made the right decision for her. It sounds like she's very happy to be home with everyone who loves her. The Evil "C" has claimed three of my scotties over the years. It seems to hit them really hard. Please give her a little pet for me. She is such a sweet, sweet girl. My heart aches for you. I am sitting here in tears because I hoped so much & prayed that Heather Beather would be OK. I feel like I know your babies because you write so beautifully about them. Know that you have a host of people who think of you & the beautiful Heather. Sending her love & would you kiss her sweet snout for me? Love you, sweet Wheatie girl. Hugs to you, Mom. I am so, so sorry to hear this about our precious Heather Beather. It feels like she is "ours" as we've come to know and love her deeply through your posts. May her remaining time with you - and yours with her - be filled with deep love, joy, and gratitude that you found each other when you did. I have lost two to this terrible thing, Higgins and Donovan, at too early of an age. I want say how it made me feel because you know. We had their Hospice at home, not sure how long we had. I took my vacation and did all the things that they loved to do, simple as sitting for hours under a tree watching ducks at their favorite camp ground, with their brother and sister sitting close. Or eating the whip creme off the top of a Starbucks latte. Your know your baby girl like I knew my precious boys, an unbreakable bond that only you share. She will.let you know when it's time. So enjoy your time, don't let her see you upset. And love the fur off of her. Ours hearts are breaking with you. She knows what it means to be truly loved. Your a wonderful Mom. So sorry to hear the news. Heather is lucky to have you all. Peace to you all. Fill you heart and hers with all the love you both have and know you have given and gotten the best love together forever! She is a sweet girl. We were there 18 months ago with Kyla's melanoma. She left this world doing her favorite thing-eating endless treats. We're tearing up for both Kyla and Heather here. Hugs to you and Heather. I am sorry that Heather has received such a cruel diagnosis but happy that you have chosen to allow her to cross the rainbow bridge when it bebomes too painful for he her. I have followed your story for a while now and often post pics of Heather and Mr K. I was there a couple years ago so nothing I can say will make things better. Just know that we (Judd & I) are sending good thoughts Heathers way. I think your new additions came into your life for a reason, to keep Mr K company when that dreaded day comes. Hang in there. I echo all of the above thoughts and the profound sadness that your news brings. Please know that you have many people all across the country and the world - praying for all of you and sending light and love. Fill your days together with joy and with love. My heart just sank when I saw the title of your post. We are sending up prays that she has many days of grace and can enjoy her time with Mr. K.
Oh Heather, we are do sorry to hear this heartbreaking news. We hope your days are filled with treats, cheeseburgers, steak, and ice cream. Scottie Mom, know that you and your crew are being lifted up in prayer. We are walking a similar path in our home right now with our cairn, Harley, who has been a great big bro to our scottie, Colin. Our hearts and prayers go out to Miss Heather that her final days will be as full of love and happiness as she deserves. Hugs to all of you!. So so sorry to hear about Heather, Scottie Mom. Prayers and good, strong energy going out to you and Heather, wanting the rest of her days to be happy, pain free and full of love. You sound strong; I know how hard it is; have been through it myself a couple of times. Glad to hear the other dogs are rallying around her; I think that helps in a way. Here for you if you want to talk, share, whatever. Pls give Heather a hug for us. You're such a good dog mama. Take care of yourself, too. Poor little Heather Beather. She is such a sweetheart and it is evident that she is loved by so many people all around the world. Our four legged friends aren't here with us for very long but they love us so unconditionally. I know that John Livingston is sad to hear the news as are we. 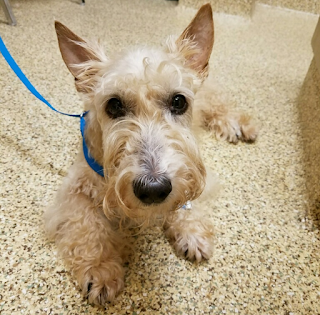 Heather is very lucky to have been given so much love from the time she came to the Scottish Terrier Rescue of TN until the end. Scottie Mom, you are wonderful and have given this girl so much love and joy. I know it will be hard on you and Mr. K but know that you have and will continue to do what is the very best for her! Miss Ginny (Heather's foster sister) sends hugs and licks to you, Heather, Mr. K, and the new ones. Hang in there! That poor little girl AND her family. Enjoy every minute you have left! Hugs. I am so sorry to hear about the return of the evil C. Just thinking about it brings on the tears. We have lost three Scotties and one corgi to the evil C. It seems unfair that a little dog should suffer so many ills. Continue to love her and feed her all of her favorite treats. Please give her a hug from me. Stay strong scottie mom. Our thoughts are with you this difficult time. Ms. Heather is a true trooper. Please give her loads of hugs. I have been praying for Heather ever since you said you were taking her to the Vet. I am so sorry to hear the news! I still pray daily for special strength for you and for Heather and also that she not feel sick or any pain. I am so happy she is home with you, and is acting like she's fine! God bless you both, and I will not stop praying for you both! !